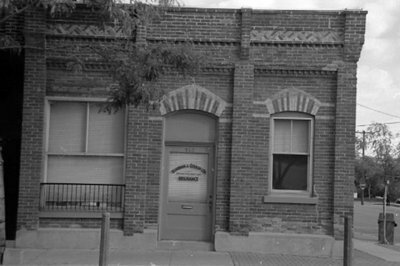 A black and white photograph of 145 Brock Street South. The sign on the front door of the building is "Bowman & Gibson Ltd". J.H. Downey’s Grain and Coal Shop was located at 145 Brock Street South. It was built in 1883 and stands at the north east corner of Brock and Colbrone Streets. From 1895 to 1919 it was operated by Mr. Downey as a grain and coal business. 145 Brock Street South, October 2005, Carl Ferencz. Whitby Archives A2013_016_007C.